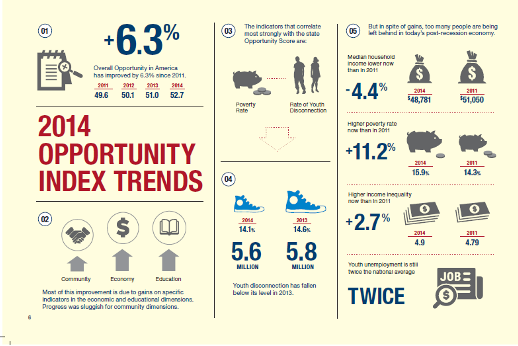 Opportunity Index 2014: Where is Opportunity in America? … The 2014 Opportunity Index is a composite look at the states and counties that perform best and worst in terms of economic, educational, and civic factors that foster upward mobility; it also highlights the places that have improved the most since 2011, the first year the Opportunity Index was presented. This research is designed to help identify concrete solutions to expand opportunity to more Americans. Opportunity is up 6.3% in the United States. In 2014, the overall Opportunity Score was 52.7 on a scale of 100, up from 49.6 in 2011. Most of this increase is due to improvements on specific economic and educational indicators (such as the unemployment rate, internet access, and on-time high school graduation rates); progress was sluggish on civic indicators such as volunteering, group membership, and access to healthy food. The number of disconnected youth and the number of people living in poverty are the two factors that most closely correlate with overall opportunity in a state or county. Though the youth unemployment rate has fallen over 30% since 2011, youth unemployment remains stubbornly high and is still twice the national level of adult unemployment. Just 10% of counties have lower scores now than they did in 2011. The top scoring county is Falls Church, VA, earning the only A+ in the country all four years. It also scored #1 in household income in 2014, 2013 and 2011 and scored #2 in 2012, with median household incomes more than twice the national average. The lowest-scoring counties from 2011 to 2014, all of which received Fs, are: Dooly County, Georgia; Apache County, Arizona; Twiggs County, Georgia; Todd County, South Dakota; Tallahatchie County, Miss., and Gadsden County, Florida. All of these counties had median household incomes significantly below the national average. The most improved county was Dimmit County, Texas, (pop. 10,481) which improved from a D- in 2011 to a C in 2014. The term “disconnected youth” refers to youth aged 16-24 who are neither working nor in school. The number of disconnected youth has declined over this four year time period, from 5.66 million in 2011 to 5.60 million in 2014. The one-year drop between 2013 and 2014 is an encouraging sign; the rate fell from 14.6 percent of all youth ages 16-24 in 2013 (5.8 million) down to 14.1 percent in 2014 (5.60 million). Youth disconnection is strongly (and negatively) correlated with the percentage of adults with an associate degree or higher, indicating that disconnected youth may be more likely to come from communities where neither parent earned at least an associate degree. In addition, youth disconnection strongly correlates with state poverty level, suggesting that disconnected youth may disproportionately live in poorer communities. These findings contribute to a compelling argument for supporting programs, interventions and investments that are designed to help low-income youth and first-generation college students attain meaningful education and career goals. Expanding civic engagement activities — particularly volunteering and increasing participation in civic organizations and service projects — may also help to reduce youth disconnection. 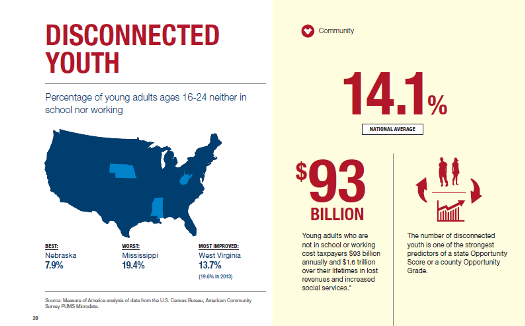 For the first time, the 2014 Opportunity Index release includes the actual number of disconnected youth at both the county and state levels (in addition to the percentage), to help communities understand more clearly the number of young adults that are disconnected from school and work. All states have improved their Opportunity Scores since 2011. The largest gains across states were in education, while civic indicators experienced only marginal improvements over the past four years. The top ranking state for the fourth year in a row is Vermont. The bottom ranking state for the fourth year in a row is Nevada. The most improved state overall is the District of Columbia, which the Index counts as the 51st “state.” DC steadily improved and climbed an impressive 15 rankings over the four-year period, from 26th in 2011 to 11th in 2014. The second-most improved state is South Carolina, which gained six rankings, from 48th place in 2011 to 42nd place in 2014. The least improved state overall is New Mexico, which dropped from 46th place in 2011 to 49th in 2014. Five most improved states 2011-2014: District of Columbia, South Carolina, North Dakota, Nebraska and Texas. Most states improved on economic and education indicators from 2011 -2014 with a few exceptions. Alaska and New Mexico lost ground on the Jobs and Local Economy dimension of the Index, while Rhode Island and South Dakota slipped in Education. There’s a lot to talk about here… please Tweet Away!